Part photographer, part community engagement technician, part stagehand. The first thing you notice about Daniel Corrigan is his height. The First Ave. house photographer looms over most crowds, but his warm demeanor welcomes you as he invites you into his office — a bench and table set up backstage in the garage. 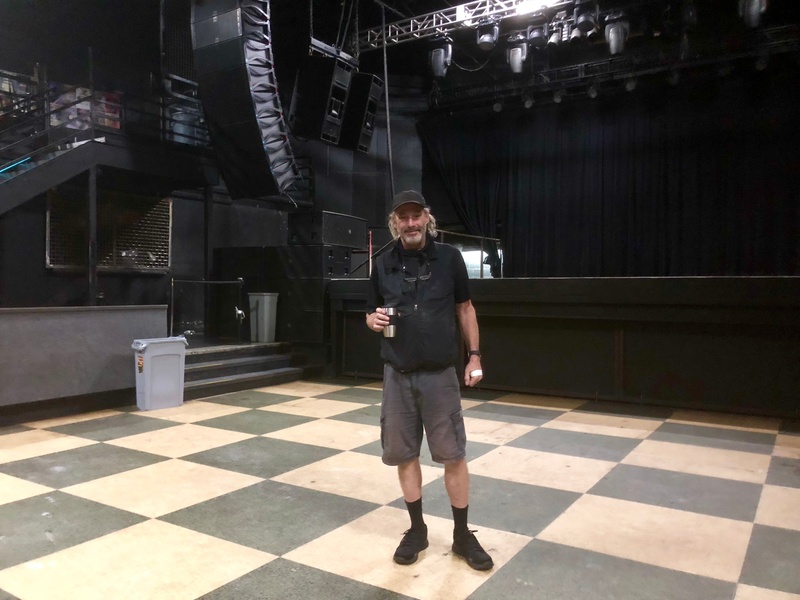 Daniel Corrigan does a lot of the behind-the-scenes work at the iconic club, sharing his knowledge with tours while continuing to take photos at shows. Corrigan is a man who needs no recognition, letting his work ethic speak louder stand for itself. Outside of concert photography, he has captured many famous images, including the well-known album cover for the Replacements’ Let It Be. On Thursday, October 25, he, along with panelists Marianne Combs, Alexei Moon Casselle, and Mike Schwandt, will share their knowledge on evolution in careers at our Happy(our) Evolution. ArcStone: How did you get started in photography? Daniel Corrigan: Back in 1980, I was hired as a photographer for the Minnesota Daily. I worked for the Daily for almost five years. I changed my major at school when I found photography. I was in my third year at school at the U of M, and I was studying Spanish linguistics — at the time, there was a lot of US involvement in Central America. I had to take an art class, and I tried to petition out of it but they wouldn’t let me. I figured photography would be the most practical in my career. When I found photography, it was all I was interested in doing. For some reason, I “got it” right away. For the first project, we have to shoot ten different pictures with an object. I carried an egg around with me. It’s pretty cliche, but it was a way to compare texture. It’s a good idea for somebody who doesn’t know what they’re doing. On the very first print I did in the darkroom, the waters parted. I knew what I was going to do from then on, and I completely changed my major. I ended up graduating with double credits, because I took every available photo class at the University. Part of that evolution was I got a job at the Daily as a lab tech. Jeff Wheeler was the photo editor at the time. He hired me, and he said, “You’re a great printer, but you’ll never be a photographer.” I started in the darkroom and moved onto doing assignments. Then I became a photographer for the Daily. I had a natural bend towards music. I do not have a musical ear, but I know a lot about putting together shows. I naturally started doing stuff for the Arts and Entertainment section of the paper. I’d been shooting shows down at First Ave. and became friends with the management. This was before the days where everyone is a photographer. It was good for business to have access to somebody that could take photos. I’m a friendly sort, so I got along with the staff and started shooting here. That basically started a 14-year-long internship. Currently I have an intern that's been working for me for the last eight years. I mostly did it, so I’d have access to shows. In 1995, Molly McManus and Steve McClellan decided that I’d been doing it for a long time that I had a nice archive. So Molly said we should get me under their wing and should have access to my other work. I was put under contract to shoot six shows a month. I’ve been doing that since. Along with that, I got onto the C list for stage hands, so I worked a lot of shows as well. They hooked me up, and I started working full time for Conrad. I did that for seven years, but I got sick of working nights. You’re the first one here, and the last one out, so they switched me to days. I still love coming down here at night and seeing the place full. I know how much it takes for all of that to happen. It’s cool to be a part of that, but for the last six years I’ve been running the facilities during the day. Daniel Corrigan: For a long time, money has not been my driving force. I try to model myself after successful musicians. They're there because they love it. It doesn’t matter what anybody thinks. You’re not doing it because you want to win a Grammy. You’re doing it, because you’re a musician and you don’t know what else to do. ArcStone: How do you adapt to changes in your career? Daniel Corrigan: It’s funny, because I had a reputation of Dan Corrigan, photographer. I don’t think I was particularly happy doing photography. I love making pictures, but what it entails to be a photographer I didn't like it. I don’t like being with difficult clients. So much of the job used to be in the darkroom, but it turned into sitting behind a computer, chasing a mouse around. I wasn’t very happy. I was going through a bunch of changes in my life. I was getting divorced. I had taken a fall off my bike and landed on my head and was dealing with TBI that messed up my eyes, and I found out I had cancer. That all happened in a short period of time. I saw someone for my health, and she said, “You know what? You don’t have to be a photographer.” Just having someone I trusted and cared for say that to me was huge; I’d been kinda moving away from it anyhow. So I said, “I used to be a photographer.” I still shoot, but it’s just stuff I absolutely want to do.” I love doing portraits. For the last eight years, I do an open call with my friends. That’s how I connect to people. I’m still a photographer, but it isn’t what I do for a living anymore. Money isn’t that important anymore. At a certain point in my life, I was making a lot more money, but I wasn’t happy. ArcStone: That’s a state-of-mind. If you’re happy with what you have, you can be content anywhere. Daniel Corrigan: I’ve realized as I get older, the only important thing out there is our connection with people. People are what make you who you are. That is, for me particularly, the one true consistent I’ve found. If you have someone come into your life and changes your point of view, you have to realize that doesn’t happen very often. If someone can do that, that is a valuable person. ArcStone: What are you most proud of? Daniel Corrigan: I’ve never been bored with my life. I did rock climbing photography. I had a really good client, and it let me travel a lot. You’re shooting beautiful people. They’re fit, tan, and they’re heroic. You’re there in these dramatic scenes, and the only way you can get there to get these pictures is because you climbed with them up there. You need two skills: climbing and photography. When you’re hanging in the air, you can’t concentrate on photography. Someone of those jobs are kickass. That’s the real deal. I’m also proud of the number of friends I have. I love it when I walk into a room, and I can tell someone is really happy to see me. That is the exchange I seek.